Investors are increasingly optimistic that a profit rebound is on the way. The rally pushed shares into positive territory over the past year, yet the stock remains far below the highs it set back in late 2015. Investors were happy to hear there was progress in the company's rebound initiatives last month. CEO Kevin Plank and his executive team revealed in early May that first-quarter sales were flat in the U.S. market, which is an improvement over the losses in prior quarters. Demand was strong in international markets and in Under Armour's direct-to-consumer business. Yet the company generated a net loss, as restructuring charges combined with weak profit margins to account for all of Under Armour's operating earnings. These costs are likely to continue pressuring earnings results through fiscal 2018 and beyond. 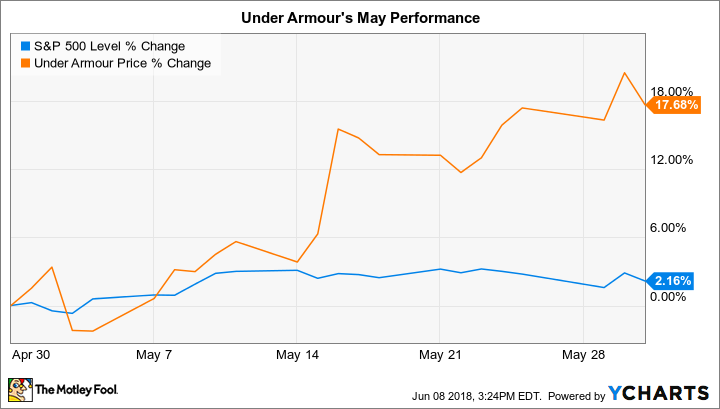 However, now that many retailers have improved their inventory holdings, pricing pressure appears to be lightening up, and that is allowing Under Armour and rival Nike to scale back on the discounts that have hurt profits lately. Under Armour's plan is to press that pricing advantage in advance of the key holiday shopping period through innovative launches like the recent expansion of the Curry 5 sneaker franchise.